I have a confession to make: every Sunday between 1 and 4 p.m., I sneak away from my cozy family life and roam the streets of Hancock Park, where I covet, fantasize and flirt with other people’s homes. I’m an open-house junkie and “Guest Search” on themls.com will lead me to my fix. When it comes to real estate, 90004, 90005 and 90020 are the sweetest digits in all of Los Angeles, and every weekend there’s a bevy of beauties cleared of clutter, waxed and fluffed, with doors wide open. I shop for interior designs, home furnishings, and landscape inspirations—without a pocketbook. I register my name in chicken scratch because, let’s face it, I’m not a buyer, just a lookie loo. I saunter through gorgeous homes: Craftsman, Mediterranean, Tudor, and my favorite, Spanish. That’s why my first stop is the white house, a character Spanish on Las Palmas whose interiors are white, head to toe kick. The freshly painted walls with dark wood floors offer a perfect canvas for buyers, as every Home & Garden TV show will confirm. But after sprucing up, one must dispose of the evidence. Empty paint cans from Home Depot in closets and on fence posts are like delicates your friends forgot to gather off the floor before giving a tour of their new digs. We know you wear them, just put them away. Unfortunate items that could not be painted white: the black seashell sinks and toilets. The 1980s plumbing fixtures have me expecting Nagel prints on the walls and Bret Easton Ellis on the shelves. Perhaps “Less Than Zero” rests in the built-in library but, like every book there, its identity is covered over with white paper wrapping (memo: book covers are interesting). The guest house over the garage suggests dewy mornings sipping coffee overlooking the pool and garden. Its hospitality is perfect for thawing visitors from the East Coast or eliminating pre-dawn house rambling from in-laws who don’t sleep. 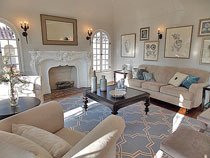 I snap out of the dream and venture on to a Larchmont demi-jewel (1700 sq. ft.) whose backyard is the hook: flagstone courtyard with a smoky green shed that could make the cover of Martha Stewart Living. A fruit tree in her dotage smiles over a maiden sapling that might drop a peach or two this summer. This house should get an offer faster than bananas go bad. My final fix is a 1921 four-bedroom whose strange remodeling starts at the modern front door with beveled glass inserts, then ends out back where Oldhami bamboo has gone to die (memo: plants need water). At $300,000 more than the demi-jewel, it’s no bargain. My time up, I quietly slip back home, undetected and high with ideas. Then I see it: my dry kumquat tree stands almost naked with only a few pieces of shriveled fruit and lifeless yellow leaves lying on the soil beneath. I run for the water hose.